I think it’s finally time to fill you in on that project I’ve been working on for the past 6 months. The one that’s kept me out of the kitchen and away from the blog. I’m extremely happy to announce that Tom and I are going to have our first child in 14 short weeks! That means I’m about 6 months pregnant. Which incidentally also means I have been really lazy and haven’t been very inventive in the kitchen. Before I was pregnant, resuscitation I kept wondering what my crazy cravings would be. Would I want ice cream and pickles? Or peanut butter and anchovies? I definitely thought I’d be into some weird foods since I’ve always been an adventurous eater. Turns out all I really want is simple food. Grilled cheese, capsule homemade burgers, lots of fuit, cereal with blueberries and ice cream. How boring. And that’s why there’s been nothing to really blog about! But I had bookmarked this recipe for Blood Orange Polenta Cake in Bon Appetit a year ago and finally got around to making it. The reviews on the Bon Appetit site were not very promising. Some people said the cake was too sweet, while others said it was too bitter. 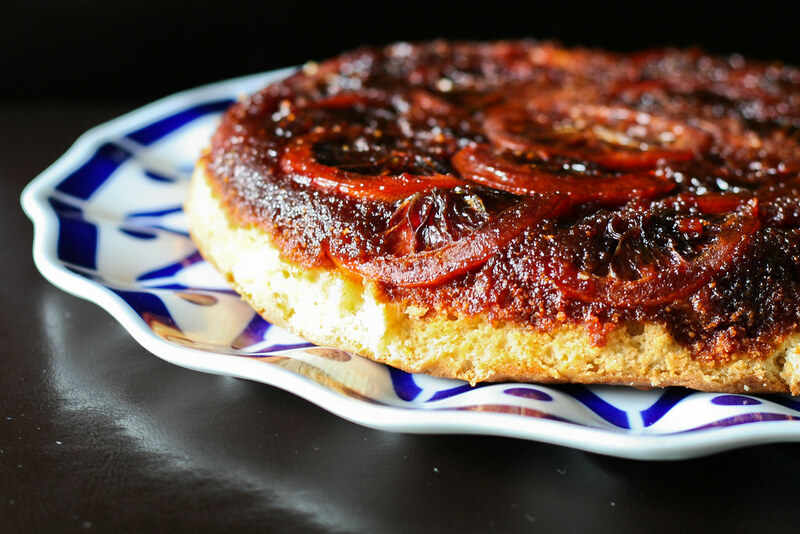 I absolutely love cornmeal cake, cornbread and blood oranges, so I thought I’d give it a try anyway. Personally, I love it. It’s not exactly dessert-y. More of a breakfast cake you’d have with coffee. It reminded me very much of cornmeal cake with orange marmelade. If you’re not into orange marmelade, then this might not be the cake for you. But if you’re looking for a special little breakfast treat, give this a go. Me and my belly approve. From Bon Appetit magazine, March 2010. Be aware that part of the recipe seems to be missing from their website. I’ve filled in the blanks below. Position rack in center of oven and preheat to 350Â°F. Combine 6 tablespoons sugar and 3 tablespoons water in 10-inchdiameter ovenproof skillet with 8-inchdiameter bottom and 2 1/2-inch-high sides. Stir over medium heat until sugar dissolves. Increase heat and boil without stirring until syrup is golden amber (not dark amber), occasionally brushing down sides of skillet with wet pastry brush and swirling skillet, about 4 minutes. Remove skillet from heat and whisk 2 tablespoons butter into caramel. Set aside. Cut off both rounded ends of each orange so that ends are even and flat. Using sharp knife, cut oranges into 1/16- to 1/8-inchthick rounds. Remove and discard any seeds. Arrange orange slices, overlapping slightly, in concentric circles atop caramel in bottom of skillet. Place the flour, polenta (cornmeal), baking powder and salt in a bowl and whisk to blend. Set aside. Using electric mixer fit with the paddle attachment, beat 3/4 cup sugar, remaining 6 tablespoons room-temperature butter, and vanilla until light and fluffy. Add egg yolks 1 at a time, beating well after each addition. Carefully, add flour mixture in 3 additions alternately with milk in 2 additions, beating batter just until incorporated. Using clean dry beaters, beat egg whites in large bowl until soft peaks form. Add remaining 1 tablespoon sugar and beat until stiff but not dry. Fold 1/3 of egg whites into batter to lighten, then fold in remaining egg whites in 2 additions. Drop batter by large spoonfuls atop orange slices in skillet, then spread evenly. Bake cake until tester inserted into center comes out clean, about 45 minutes. Cool cake in skillet 10 minutes. Run small knife around cake to loosen. Place platter atop skillet. Using oven mitts, hold platter and skillet firmly together and invert, allowing cake to settle onto platter. Rearrange any orange slices that may have become dislodged. Cool cake completely at room temperature. Using electric mixer, beat chilled crÃ¨me fraÃ®che and 2 tablespoons sugar in medium bowl until mixture thickens. Cut cake into wedges and serve with dollop of whipped crÃ¨me fraÃ®che. The cake gets baked in the same skillet you use to make the caramel. Here are a few key assembly points to keep in mind after you follow the recipe to make the syrup. â€¢ As soon as the syrup turns golden amber, take the skillet off the heat. â€¢ Arrange the orange slices as pictured, overlapping slightly, in concentric circles atop the caramel. â€¢ Mix the batter and drop it by large spoonfuls atop the orange slices in the skillet, then spread evenly. (Don’t pour the batter; you risk jostling the oranges.) Bake as directed. Congratulations! I found it so hard to find something I actually wanted to eat, so I completely understand. The cake looks fabulous! 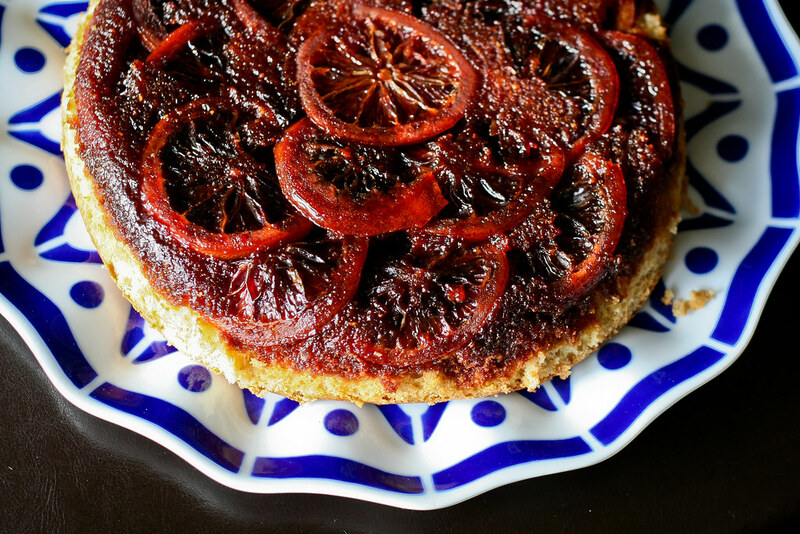 Love the look of this cake – I’m a big fan of the less-sweet breakfast cake and blood oranges basically make my world go round. WOOHOO! Mega congratulations girl! Really, you don’t even look 6 months pregnant. And that is an adorable dress. Now that so many of my favorite bloggers are pregnant it’s gotten me thinking about what I’m going to be craving as well. I could totally eat grilled cheese for 9 months. That’d be okay. I’ve had my eye on this cake for a while so I’m glad you gave it two thumbs up! btw, I made your brown rice granola bars and they totally rocked the joint in a big way! I posted about them and linked back to you on Simply Healthy Family if youd like to check it out! Yay! How exciting. And lovely dress! Hope you feel well till the final months. Happy to see a post from you and with such good news! Love that photo. I have had that cake bookmarked also forever, must try it. Hope you continue to post your delicious recipes once the bambino arrives! I make your pork roast w/ the red onions, lime and cilantro often! I’ve gotta say though, this cake does not look appealing to me, but what do I know? My sophisticated palate craved white powdered doughnuts (from a vending machine!) when I was pregnant, haha! Congrats! How exciting. That polenta cake looks amazing. Congratulations! The cake looks amazing. Congrats, Mel! I’m glad to see the reason you haven’t been posting as much is for a very happy, exciting (and totally legit!) reason! Good luck to the three of you! Oh my, I LOVE polenta cake. This looks like a must-try. And a hearty congratulations, of course! Congratulations! I love checking out all your recipes and popped in to figure out what to make for dinner tonight. What a wonderful surprise. Jennifer – Congratulations! Yes, the dress is maternity and it’s from motherhood (belt doesn’t come with it). I just looked for it online to send you a link, but I don’t see it. Weird because I just saw it at the store a few weeks ago! How wonderful! Does that mean a year from now we can look forward to fun baby food recipes? I definitely would love to hear how you introduce your baby to good food. Congrats on baby! I LOVE LOVE LOVE Blood Oranges and this looks fabulous! Congratulations to you and Tom!!!!! I hadn’t stopped by here lately because I too have been out of the kitchen but not for the same reason..lol. I LOVE your outfit, and recipe looks fab as always. Good luck with the little one! Congratulations to you and Tom! That’s great news!!! You have a beautiful baby bump! What a lucky baby! A mama who cooks good food!! I am LOVING that outfit! Mel, you look so cute :) Congratulations to you & Tom! Wow, this is belated!! I’ve been so busy that browsing the food blogosphere hasn’t been happening much. The items embody a variety of goods e,new balance 574 mens australia. Manulife Financial Corporation added 2. Since they only can offer better discounts and good quality.